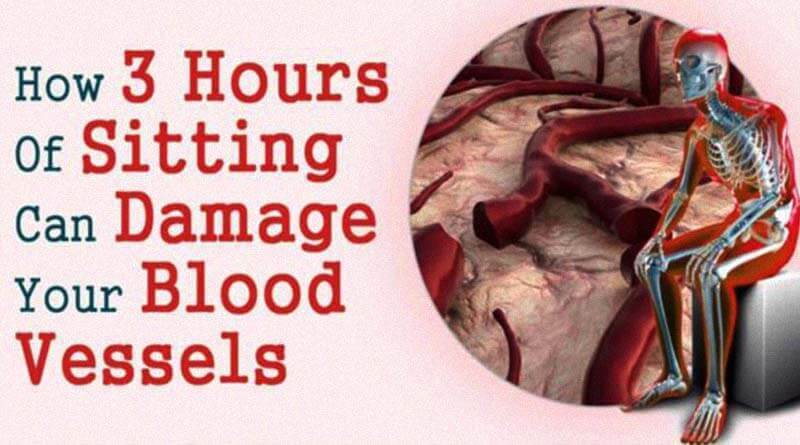 How 3 Hours of Sitting Can Damage Your Blood Vessels. - ShareIt! Growing evidence emphasizes the risk of excessive sitting for adults, but it turns out that they are not the only one at risk as children spend over 60% of their day sedentary. While only an estimate, children sit about 8.5 hours a day. At the beginning of the study, all of the girls had healthy arterial function. But, there was a significant reduction in vascular function after sitting for three hours, watching movies or playing on tablets. Arterial dilation fell by 33%, which is alarming if we take into consideration the fact that 1% decline in vascular function increases heart disease risk by 13% in adults. When the girls returned to the lab, their artery function had gone back to normal. When the sitting was interrupted by 10-minute cycling session, no decline in vascular function was noted. “This research suggests that children are not that different from adults in terms of fundamental physiology of the body… It confirms that sitting compresses blood vessels in young people just as much as it does in adults [and] just as much as it does in elderly,” Alan Hedge, professor of Ergonomics at Cornell University told the CNN. American adults spend 9-10 hours a day sitting! This is so much inactivity that even a 30-60 minute of exercise cannot hinder its effects. On the other hand, it has been found that people in agrarian villages sit for 3 hours daily. Since the body was made to be active the majority of the day, failing to do so causes negative changes. The Mind Unleashed presented an important description of what happens in various areas of your body after prolonged sitting. Read on to learn more! Heart: The blood flow is slower and the muscles burn less fat when you sit, which makes the fatty acids more likely to clog the heart. According to a research published in the Journal of the American College of Cardiology, women who sit more than 10 hours daily are a higher risk of developing heart disease when compared to those who sit 5 hours or less. Pancreas: The body`s ability to respond to insulin responds after a day of excessive sitting, which leads to increased production of insulin by the pancreas. According to a research published in Diabetologia, those who sat for the longest periods of time were twice as likely to have diabetes or heart disease when compared to those who sat the least. Colon Cancer: Although the mechanism is not fully understood, excess sitting may increase the risk of colon, breast, and endometrial cancers. It is believed that excess insulin production encourages cell growth. According to the findings presented at the 2015 Inaugural Active Working Summit, excess sitting also increases the risk of lung cancer ( 54%), uterine cancer (66%) and colon cancer ( 30%). Sedentary lifestyle slows down the function of the brain, which gets less fresh oxygen and blood, needed for the release of brain-enhancing chemicals. Strained Neck and Shoulders: Holding the head forward while working at a computer leads to strains to the cervical vertebrae as well as permanent imbalances, mostly manifested by neck strain, sore shoulders, and back. Back Problems: Sitting puts pressure on the spine, especially if you are sitting in front of a computer. While only an estimate, nearly 40% of people with back pain spend a lot of time at their computer daily. The disks in the back are supposed to expand and contract while moving, which helps them absorb blood and nutrients. While sitting, the disks are compressed and tend to lose flexibility as time passes by. Hip Problems: Excess sitting affects the hips, which become tight and limited in range of motion. As for elderly individuals, decreased hip mobility is the major cause of falls. Varicose Veins: Sitting is directly linked to poor circulation in the legs, which in turn causes varicose veins and swelling in the ankles. Weak Bones: Any physical activity, such as walking or running, leads to stronger bones while lack of activity causes weak bones and even osteoporosis. Restlessness, squirming, and frequent fidgeting are the major symptoms of attention-deficit hyperactivity disorder (ADHD) in children. To fight this problem, some schools have started giving children more chance to move around during the day. Some of them have even introduced chair-less standing desks! According to a study published in the journal Preventive Medicine, which analyzed 23 active desk studies, they improved mood and reduced sedentary time. They were also found to boost heart rate by about eight beats per minute, boost good cholesterol, stimulate weight loss, reduce tension, confusion, and depression, and increase vigor and energy! Instead of having everything nearby, organize the office so that you`ll have to stand up to reach the telephone, the printer, or oft-used files. Besides adults, children also need to stay active during the day. The problem is that this has become quite difficult these days, mostly because most kids spend a lot of time in front of computers, tablets, and TV.